For more than two years, wiiw economists and researchers from SEE analysed reasons for & ways out of the Balkans’ development trap. The results are on the wiiw Balkan Observatory website. 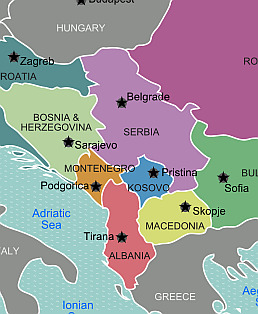 Southeast Europe (SEE) holds a long record of being one of Europe’s least developed regions. The specific puzzle of this region is that it is geographically and in many other relevant respects very close to or indeed part of the developed Europe. Still, its development has proceeded in spurts and failures over the long run and it has remained a relatively backward region in Europe until now. Successive attempts at catching up with the more developed countries in Europe have tended to fail or to proceed very slowly, and there have been instances of reversals and not just of falling behind. For close to two decades, wiiw has been working on issues of development in the Balkans within the framework of the Global Development Network Southeast Europe (GDN SEE), in particular on those of elusive development due to lack of sustained industrialisation and of consistent development policies. The aim of our latest GDN research project, Falling Behind and Catching Up – Southeast Europe (2014-2016), was to understand the reasons for the lagging-behind of the Balkans. To that end, more than twenty wiiw and local researchers elaborated a series of Working Papers that have recently been published via the wiiw Balkan Observatory, a well-established portal for research and communication related to economic developments in Southeast Europe. Furthermore, two wiiw Policy Reports summarise the policy recommendations and research findings from the bi-annual research project. Perhaps the key finding is that processes of state-building and their failure have been mostly responsible for both spurs and failures of industrialisation. The enduring disconnects between political and economic interests are certainly fundamental for the long-term development of the region. The other conclusion is that infrastructure and other investments with large public goods elements and significant externalities have enduring effects on the potential for development and in particular industrialisation. That supports the hypothesis that investments in fixed costs and the access to larger markets help shift development from traditional to modern sectors. Concurrent with that, trade liberalisation is found to support development as it allows for capital and knowledge accumulation. On the negative side, Balkan economies tend to have significant difficulties with the policies of adjustment to external and internal imbalances. In that, the long-term low level of employment and high unemployment together with endemic outward migration are the key failures in the policies of adjustment to internal and external shocks. Firms and banks are weak in entrepreneurship and sustainability respectively. Both experiences with foreign investments and with reliance on domestic banks and entrepreneurs have proved to amplify the problems in times of crisis. Some role in that is played by the widespread corruption, especially when it comes to public investments and public procurement. Crises play a role of disruptors in the process of development, in particular via the political and policy maladjustment. External imbalances more often than not are the main weak spot. In general, the Balkans tend to finance investment from foreign resources, but tend to adopt policies which lead to the ensuing external imbalances to become unsustainable. So, much of the recurrent process of falling behind can be explained by financial and foreign debt crises. Integration is another weak spot in the Balkans. Balkanisation is in part the consequence of state-and nation-building, but is also an inadequate answer to security concerns, in part self-generated. So, constant attempts at intra-Balkan integration and the integration with the developed Europe tend to fail due to external and internal disintegrative influences. In general, it is this disconnect of the economic and political interest and unsustainable policies that account for the recurrent spurs and failures of development and the long-term falling-behind of the Balkans. The broad theoretical approach taken in this research project can be characterised as that of the ‘Austrian theory of development’. It relies on the seminal work in development economics by A. Gerschenkron, P. Rosenstein-Rodan, and A. Hirschman. Their model has been summarised well by P. Krugman. It revolves around three main ideas. One is about the key role of the state, in the absence of entrepreneurial firms and functional banks, in pulling countries out of backwardness or being responsible for spurs that fail (Gerschenkron). The other is about the importance of the ‘extent of the market’, i.e. market integration to large-scale investments (Rosenstein-Rodan). The third is the upstream and downstream spill-overs in supporting industrialisation (Hirschman). So, the role of increasing returns (Rosenstein-Rodan and Krugman), of self-supporting demand for investment (Hirschman), and of the long-term economic policy (Gerschenkron) are the keys to development or lack thereof.